A Swiss Solar plane took off from Abu Dhabi marking the start of the first attempt to fly around the world without a drop of fuel. The flight should take around five months to complete the 21,748-mile journey that has been divided into 12 manageable trips. The plane took off on 8th March and it is expected that it won’t likely to return before late July or early August. The route will take stops in India, Myanmar, China, Hawaii and a string of cities on the U.S. mainland, plus a spot in southern Europe or North Africa, and then back to Abu Dhabi for the final time. It will not only cross different continents but also fly over the Pacific and the Atlantic oceans. Two pilots André Borschberg and Bertrand Piccard was at the control of the single-seater Solar Impulse 2 airplane as it took off from the Al Bateen Executive Airport. The founder Borschberg will trade off piloting with the co-founder Bertrand Piccard during stop-overs on a journey that will take months to complete. They will be flying one after the other in the single-seater cockpit. The airplane will cover a journey of 35000 km with no fuel on board. The 5 months mission (March-August 2015) has 500 flying hours approximately and it has a support team of around 60 people. Two years ago, Solar Impulse’s Bertrand Piccard and Andre Borschberg became the first pilots to fly a solar powered airplane through America without burning a drop of fuel and now they are up to a new record to fly over the whole world without the drop of the fuel. The plane will be on the ground for days or weeks at a time to accommodate maintenance requirements and public events. Borschberg took the controls for the take-off at Al-Bateen executive airport in Abu Dhabi early on Monday. Its first destination is Muscat in Oman. Piccard will pilot the final flight. They have a plan that Piccard will fly across the Pacific and Borschberg will span the Atlantic. During their journey over the oceans, the two pilots will have to stay in the cockpit for up to five days and five nights without stopping. The pilots will roughly have 250 hours each inside the narrow cockpit with no oxygen or temperature control. Temperatures outside will range between -40C to 40C. They cannot sleep over a longer period of time. They have to survive on 20 minutes nap every two to four hours. There will be no doubt concentration problems and discomfort of sitting for such a long time and they have adopted yoga to eliminate the physical discomforts. Compared to any Boeing 747, Solar Impulse 2 have 72m wingspan than Boeing’s 68.5m. A Boeing weighs 154 tones but the solar plane is much lighter like the weight of a car around 2-3 tones. It has 17,000 solar cells that line the top of the wings, and the energy-dense lithium-ion batteries that will be used to sustain night-time flying which will be essential to be operated in darkness. As the wing cells store energy from the sun, the Solar Impulse 2 can fly at night as well as during the day. The Solar Impulse airplane has a maximum speed of 140 km/hr. Each leg will take several days and nights to complete. You won’t be able to travel though the world with the pilots in the solar airplane but there is a super chance to track the plane’s progress by clicking here. This is amazing ,to cover an area of 35,000km without fuel.This is a thing of the future and should be funded.Good luck with the record of flying around the world without fuel. congratulations!. 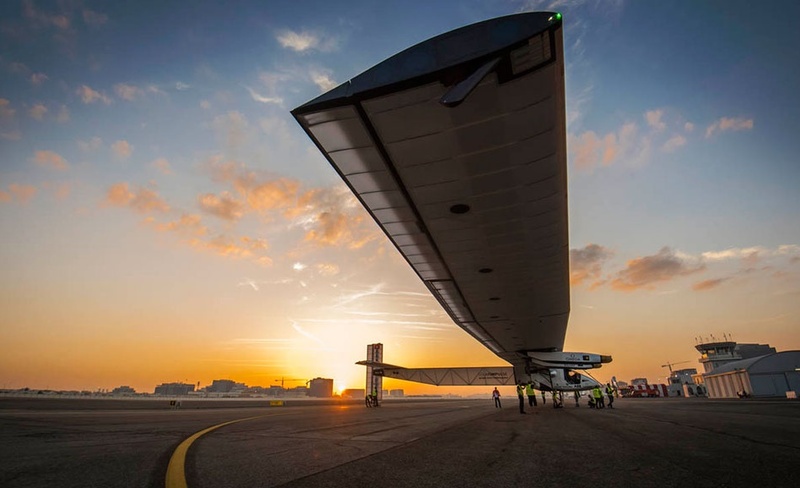 Solar energy finds a new application in aviation sector.The solar impulse plane can be able to fly day and night without a single use of fuel.This may be a new hope to aviation fuel. Interesting, but so many stops hardly makes it seem appropriate to call it ‘around the world.’ Now, if it was a continuous flight, that would be something else.